May 22, 2017 2 comments on "Canning Lilac Jelly"
Lilac jelly is a truly unique gift idea, a fun treat to make for the people who “have everything.” It has a wonderfully floral taste and scent! 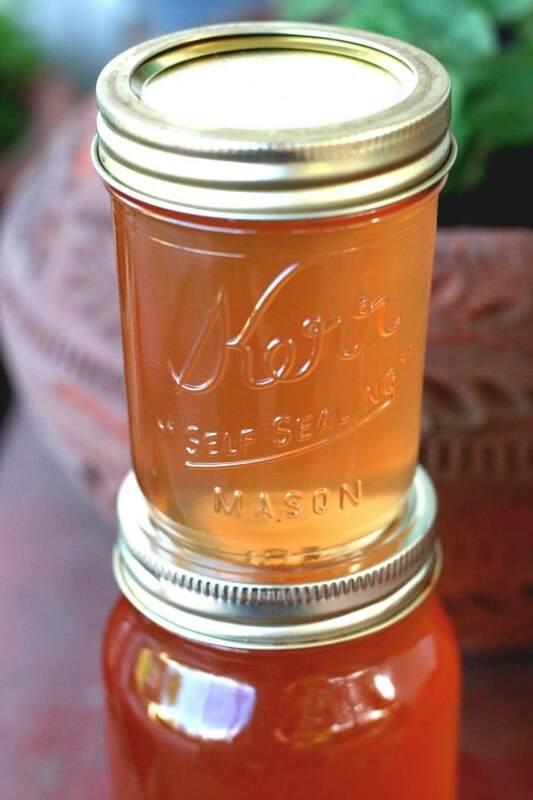 You will love this recipe for canning lilac jelly. Lilac jelly is now one of my favorite top 10 easy homemade jelly recipes. New to jelly making? Watch this video below as I prepare this lilac jelly recipe step by step. Let the lilac mixture sit for about an hour. Pour the mixture through a fine mesh strainer to remove the lilac flowers. You should end up with a clear liquid. If not, try pouring it through the strainer again. Measure the tea, adding a little water if necessary to get exactly 4 cups of liquid. Stir in lemon juice. The liquid should change in color to be similar to the original color of the lilacs. The darker the lilacs, the darker the color of the jelly. Violet colored lilacs will make a rose colored jelly. Experiment with different flower colors! Pour liquid into a large stock pot. Sprinkle the pectin on top of the juice and use a whisk to mix it together. Stirring constantly, heat until boiling. Boil for one minute. Remove the pan from the heat. Remove any foam with a metal spoon. Ladle the jelly into hot sterilized jars, leaving ¼ inch head space, and process in boiling water canner for 5 minutes. Remove the jars from the canner and place on a towel on the kitchen counter to cool. Sealed jars can be stored in the pantry for 1-2 years. If you have any jars that do not seal, just place them in the refrigerator to eat in the next month or two. Jelly can take a day or two to set completely, so don’t disturb it for a couple days even if it doesn’t set completely. If after a couple of days your lilac jelly has not set, follow these instructions for what to do if your jelly does not set. Like this recipe? 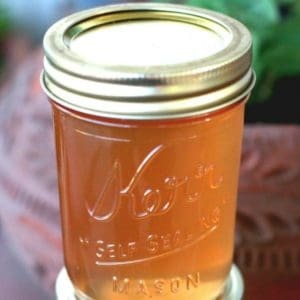 Try my recipe for canning lilac syrup. 2 Comments on "Canning Lilac Jelly"
Hi! You will have to re-boil the jelly, but you can save it! Here are instructions for fixing jelly that doesn’t set. You need to add a little more pectin and sugar to try to get it to set. There are instructions for using liquid pectin. Good luck!